Bees buzz along. Birds sing a love song. Turtles play peek-a-boo. Babies laugh and say goo, goo...Snuggle-Me Stories is an irresistible new board book series from Sandra Magsamen, featuring an adorable plush finger puppet. In Butterfly Kisses, babies and loved ones will read and play along with the rhyming story which delivers heartfelt sentiments of love. 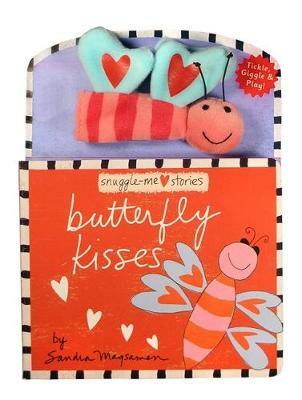 The colourful butterfly finger puppet is securely attached to the board book and sure to provide hours of giggly fun. Perfect for cozy laptime reading, Snuggle-Me Stories will inspire parents and children to snuggle up and read together!